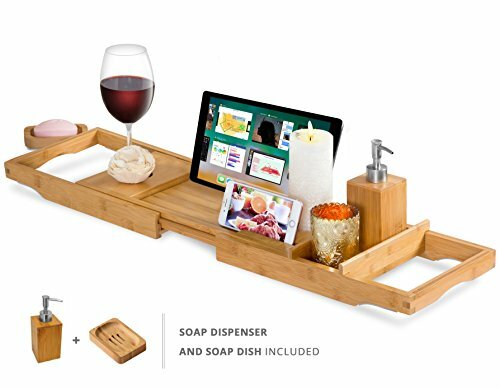 This Bamboo Bathtub Caddy Tray by Comfysure transforms your home bathtub into a spa-like retreat with compartments to hold accessories. Sip a glass of wine or cup of tea, immerse your mind in your favorite book, or light a scented candle as you soak. There is nothing like unwinding after a stressful day in a bubble bath as the warm water soothes muscles and relaxes the body and mind. Bathing is a necessity, but why not make it a luxury? Uniquely designed to accommodate two bathers, our tray's compartments hold accessories for two. Perfect for couples on a date night, honeymoon, or anniversary, it allows bathers to enjoy each other's presence and bask in warm candlelight while sipping elegant glasses of wine. This Bamboo Bathtub Caddy Tray also makes a perfect pampering present for a special someone. Give the recipient the gift of leisure time with permission to indulge in a hot tub bubble bath that melts away stress. Dimensions: 9 x 29.5 inches, expandable up to 44"
Want to get comfortable while catching up on emails or completing an assignment? Simply slide your tablet, smartphone, or other electronics into the long slot of this tray and work from the comfort of your tub! If you prefer to lounge in a recliner seat, this tray works great as a laptop desk. Craving breakfast in bed? Have your spouse prepare you a hearty meal served on this tray. Read children a bedtime story during their nighttime bath. Save time and get kids to fall asleep faster! Aside from the home, this tray also works well for hotel room service and spa treatments. CONVENIENT SHELF: This bath caddy is more than just a tray. Use it to read books, magazines or newspapers; a slot holds electronic devices; 2 round slots can hold candles, cups, soap or even wine glasses. PREMIUM BAMBOO WOOD: Strong yet lightweight, bamboo is an ideal material. Water resistant, our bathroom tray stays in good condition even if splashed on, unlike metal or plastic which may rust or mold. A VERSATILE ACCESSORY: This tray works well as a portable desk when using your laptop on a recliner seat. Its 29.5-44" adjustable width fits all standard tubs, and it can go on chairs & more. It's also a great gift. TRAY FOR TWO: Unique from other bath caddies, our compartments accommodate for two in the tub. Perfect for your honeymoon, anniversary or date night with glasses of champagne and romantic candles. BREAKFAST IN BED: This bath organizer doubles as a serving tray outside the bath room. Enjoy a mother's day breakfast without leaving the comfort of your soft, plush pillow, and get the room service feeling. If you have any questions about this product by ComfySure, contact us by completing and submitting the form below. If you are looking for a specif part number, please include it with your message.